Like a Bullet: Walker is so hot that his next record will feature an all-star cast of blues and soul guitar greats. ASK Joe Louis Walker about the pressure he feels as one of the top new blues artists in the music industry and the usually shy guitarist will give you an earful. "Every night you've got to be good--people don't understand anything else, especially the critics," he says. "For younger guys, like myself, we have a lot more to compete with, including reissues of classic blues sides and reissues of those reissues. You're lucky if you even get heard. It's feast or famine." These days, it's a feast for Walker. The handsome 46-year-old Novato resident has just placed second in the prestigious 61st annual Downbeat Readers Poll, carried by the force of his powerful Blues of the Month Club (Verve). Earlier this year, he and his Bosstalkers--who deftly walk a fine between traditional blues and modern funk and delivered blistering performances at this year's San Francisco Blues Festival and the Monterey Jazz Festival--were hailed as the Blues Band of the Year. His songwriting skills have earned a host of accolades, including a nod for his contribution to B. B. King's 1993 Grammy-winning album, Blues Summit (MCA). And next year should be even bigger. Walker recently completed an as-yet-untitled album, due in April on the Verve label, that features an impressive lineup of great blues and soul guitarists, including Bonnie Raitt, R&B pioneer Ike Turner, former Elvis sideman Scotty Moore, Little Charlie Baty, Stax Records legend Steve Cropper, Buddy Guy, Clarence "Gatemouth" Brown, Otis Rush, Matt Guitar Murphy, Taj Mahal, and Robert Lockwood Junior. The Tower of Power Horns and members of the Johnny Nocturne Band also appear. The star caliber of the upcoming album is quite a tribute to Walker's status as an up-and-coming blues powerhouse. "It's great company and I was real pleased that they could take the time out to contribute," he says modestly, adding that "I like it already." But it's been a long, hard trek for this blues survivor. Enjoying a rare day of relaxation at his Novato home, this San Francisco native reflects on his days scuffling around Haight-Ashbury in the '60s while the city was in the throes of a blues revival. For a spell, he shared a Mill Valley home with the late Mike Bloomfield, the then-influential guitarist with the Paul Butterfield Blues Band. "He opened my eyes to a lot of stuff, a lot of guitar styles," Walker says of Bloomfield. "He allowed me to see how he dealt with the music business, which was hard on him. He didn't like the business side because he felt like he was getting screwed, which he was, along with everybody else." Walker later jammed with the Grateful Dead and Steve Miller, before launching a 10-year stint with the Spiritual Corinthians. 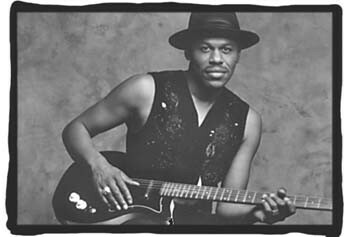 In 1985, he rejoined the blues fold, recording five critically acclaimed albums for the Hightone label that spawned bluesman Robert Cray. Some saw Walker as the next Cray, but Walker's visceral style is far grittier than the sweet soul of his former labelmate. But it's the incessant touring that has brought Walker to the attention of world audiences. That growing fame has not come without a cost. "It's like dog years, figuring all those days spent on the road," says a road-weary Walker, who celebrates his 47th birthday on Christmas Day, "because it doesn't always take into account that you have to get up at four in the morning to get from here to there, and after a while, it can wear you out. But I ain't complaining--I'm happy with what I'm doing." Joe Louis Walker and his Bosstalkers perform at 9:30 p.m. on Friday, Dec. 20, at the Mystic Theater, 21 Petaluma Blvd. N., Petaluma. Admission is $7. 765-6665.